The work of Maren Conrad on the western wall of the MARRS building, painted during the 2017 Wide Open Walls festival. 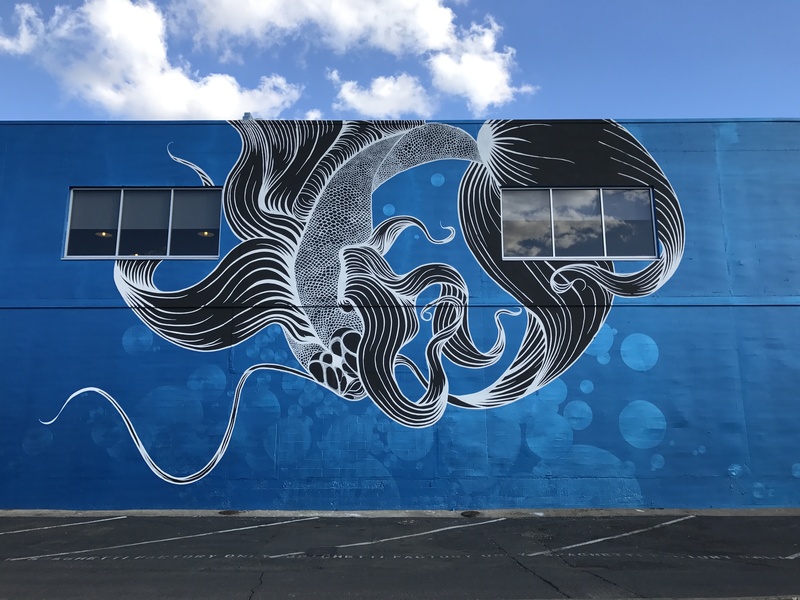 The Wide Open Walls mural festival returns Aug. 9 and we’re hearing the first details on who’s painting what and where. Shepard Fairey will adapt an iconic photo by Jim Marshall of Johnny Cash for the Residence Inn wall facing Folsom State Prison, Michele Murtaugh will paint four silk aerialists on the Elks Tower and Aik Brown is focused on the concept of “home is where the heart is” for the St. HOPE Home Office in Oak Park. In anticipation of the 10-day event featuring 40 local, national and international artists, I’ve curated a guide to the existing murals created during the last two summers. My tour starts near the River District, through downtown and midtown, to East Sacramento, along Power Inn Boulevard, from South Sacramento to Oak Park, along Broadway to Southside Park, and ending in R Street Corridor. Along the way, you’ll see 51 murals from the Sacramento Mural Festival of 2016 and Wide Open Walls of 2017. My recommendations will direct you to the murals by car and by foot. You could certainly bring a bike along for certain segments of the tour. Make sure to use the hashtag #wideopenwalls916 when sharing photos. If you’d like to see the murals with a guide, check out Sac Tour Company and Sacramento Cycling Tours. If you’d like to recommend another route, submit your suggestions in the comments. View the locations, including this year’s announced murals, using this map. (red dots = completed murals and blue dots = murals coming soon). Locations are subject to change. View my complete mural map here. Let’s begin north of downtown at 1330 N B St.
On to the next mural: Drive west on N B Street. Turn left on N 12th Street. Turn left down Chinatown Alley, between C and D streets. The next mural will be on your left, before 13th Street. On to the next mural: Turn left on 13th Street and then right on C Street. The next mural will be on your left, before 15th Street. On to the next mural: Turn around and drive west on C Street. Turn left on 12th Street. Turn right on I Street. The next mural will be at the end of the road at 2nd Street. On to the next mural: Turn around and drive east on I Street. Turn right on 3rd Street. Turn left on J Street. Turn left on 8th Street. Park on 8th and walk west down Improv Alley. The multiple-piece mural will be on the right. On to the next mural: Keep walking west down Improv Alley. The next mural will be on the left. Thanks to @wideopenwalls916_ Sacramento now has a @phlegm_art wall to call our own. On to the next mural: Keep walking west down Improv Alley. The mural will be on the left. On to the next mural: Head back to the car. Turn left on I Street. Turn left on 7th Street. The next mural will be on the right, right after the Starbucks and next to the Art Hotel. On to the next mural: Head south on 7th Street. Turn left on Capitol Mall. Turn left on 8th Street. Turn right down Jazz Alley, between J and K streets. Look up, the next mural will be on the right. On to the next mural: Turn left on 11th Street. Turn right on J Street. The next mural will be on the left before 12th Street. On to the next mural: And the next mural is on the adjoining side of the building. Niseli With the exacerbation of nuclear tensions today more than ever there is a need for atomic disarmament. On our planet there are over 16k nuclear warheads that potentially have the capacity to destroy human civilization and cause extinction. The state of United States of America is the first to produce, test, and use a nuclear war weapon (1945), and is the state with the world's largest military presence and power having 686 military bases in 74 countries over the sum of all other states. for this reason they are the first who MUST start disarming and THEN pretend that other states do the same. this must be done before it's too late and it's all about us none exclude. On to the next mural: Head east on J Street. Turn right on 15th Street. Turn left down Kayak Alley, between K and L streets. Look up, the next mural will be on the right. You might get a better view from the parking garage. On to the next mural: Head east on Kayak Alley. Turn left on 16th Street. Turn left on I Street. Turn left on 15th Street. Turn left on J Street. The next mural will be on the right, before 16th Street. On to the next mural: Head east on J Street. Turn right on 18th Street and park before K Street. Walk east on K Street. The next mural will be the left. Artist @RoyGonzalezInk painting a mural for the @WideOpenWalls916_ mural festival organized by @DSAEvents and @BrandedArts in Sacramento, California. Work in progress! On to the next mural: The next mural will be on the left on the same wall. On to the next mural: Head back to K Street. Walk west on K Street. Turn left on 18th Street. Cross L Street and turn right. The next mural will be on the left. On to the next mural: And the next mural will be on the right. A good time to grab a coffee, if you haven’t already done so. On to the next mural: Walk east on L Street and cross 19th Street. Turn left and walk north 19th Street until you see the next mural. On to the next mural: Walk north on 19th Street and cross K Street. Turn left and walk east on K Street. The next mural will be on your left. On to the next mural: Head back to K Street and walk east to 20th Street. Cross back to the other side of K Street and continue east. The next four murals will be on your right along a parking lot. On to the next mural: Walk west to 20th Street and cross K Street. Continue north and turn right down Jazz Alley, between J and K streets. The next mural will be on your left. On to the next mural: Walk east and turn left when you reach 21st Street. Walk north and turn left on I Street. The next mural will be on your left. On to the next mural: Head back to your car on 18th Street and drive south. Turn left on O Street and then turn left on 21st Street. The next mural will be on your right. On to the next mural: Continue north on 21st Street. The next mural will be on your left, before Capitol Avenue. On to the next mural: Turn right onto Capitol Avenue. The next mural will be on your left, along a parking lot between a business building and a parking garage. On to the next mural: The next mural will be on the adjoining wall. On to the next mural: Head east on Capitol Avenue. Turn right on 24th Street and then turn left on O Street. The next mural will be on your left. On to the next mural: Head east on O Street. Turn right on 28th Street. The next mural will be on your right, after R Street. On to the next mural: Turn left on S Street. Head east and turn left on 34th Street. The next mural be on your right, after Stockton Boulevard. On to the next mural: Head south on 34th Street. Turn left onto Stockton Boulevard. Turn left to merge onto US-50 E toward South Lake Tahoe. Take exit 9 for Howe Avenue. Turn right onto Howe Avenue. Continue on Power Inn Road. The next mural will be on your right, after passing under the light-rail tracks. On to the next mural: Head south on Power Inn Road. Turn right on Cucamonga Avenue. Turn right on Ramona Avenue. You’ll see the next mural, from a parking lot, where Ramona Avenue and Brighton Avenue meet, past the light-rail tracks. Please be safe around this mural. On to the next mural: Head southeast on Ramona Avenue. Turn right on Power Inn Road. The next mural will be on your left. On to the next mural: Head south on Power Inn Road. Turn left on Belvedere Avenue. The next mural will be on your left. SACRAMENTO @wideopenwalls916_ Final touches on 10,200 square foot wall that almost got the better of myself and @_emjay_ on multiple occasions. I can't wait to get some final photos of this one. Thanks @ironlak @brandedarts @wideopenwalls916_ for all the hospitality. On to the next mural: Head west on Belvedere Avenue. Turn left on Power Inn Road. Turn left on Alpine Avenue. The next mural will be on your left. On to the next mural: Turn right on Power Inn Road. Turn left on 14th Avenue. Turn left on 44th Street. The next mural will be in the center of the campus. On to the next mural: Head north on 44th Street. Turn left on 14th Avenue. Turn right on Martin Luther King Jr. Boulevard. Turn left on Broadway. Turn left on 34th Street. The next mural will be on your left. On to the next mural: Head north on 34th Street. Turn left on Broadway. Turn left on 3rd Street. The next mural will be on your right. On to the next mural: Head north on 3rd Street. Turn right on Broadway. Turn left on 5th Street. Turn right on S Street. The next mural will be on your left, after 7th Street. On to the next mural: The next mural will be along Rice Alley, north of the CADA parking lot. Artist @MicahCrandallBear posing in front of his mural for the @WideOpenWalls916_ mural festival organized by @DSAEvents and @BrandedArts in Sacramento, California. Finished! On to the next mural: And the next mural will be to your right, on the same wall. Artist @MilesToland posing in front of his mural for the @WideOpenWalls916_ mural festival organized by @DSAEvents and @BrandedArts in Sacramento, California. Touching the moon! On to the next mural: Head east on R Street. The next mural will be on your right, after 11th Street. On to the next mural: Head east on R Street. The next mural will be on your left, after 13th Street. On to the next mural: The last mural in my tour may be the most subtle. Head east on R Street and park near 15th Street. The murals are at the northwestern and northeastern corners of the R Street Parking Plaza. Congratulations! You’ve seen them all. Now go get some Hot Italian pizza. BONUS: The following six murals were painted at the last two year’s festivals and are no more. A reminder that nothing lasts forever. Thank you #lebasseprojects #sacramentomuralfestival #sacramentoartscouncil and all of my lovely volunteers! art summer camp has been so fun! thanks to Kaiser Permanente, @beaubasse @kimmelle @lebasseprojects @ellierex and @smac_sacartscommission for letting me paint and ride this lift all day! and @blainesuque for the best photos.